CCTV cameras have helped to catch a vandal damaging Dunstable’s skate park. In October half term the Skate Park suffered from a spate of vandalism which frustrated and angered skaters and town council officers alike, following years of hard work to secure the facility. But CCTV camera’s which had been installed to ensure that the skate park remained a safe environment caught a vandal in the act. The young man could be clearly seen with a sling shot, making several attempts to hit the CCTV camera, and with this final shot he was successful causing more than £350 worth of damage. All of this was caught on camera, managed by Central Bedfordshire Council (CBC), which the Bedfordshire Police Community Team were able to view and positively identify the individual. 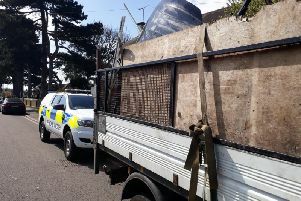 As a result the individual has been charged with criminal damage and has also been issued with a Community Protection Notice, preventing him for revisiting the area of the Skate Park. And council officlas are hoping the punishment sends out a clear message that vandalism to the park will not be tolerated. Cllr Pat Staples – Chair of Community Services said “It was very disheartening to hear about the vandalism to this new and well used facility. “I hope that the conviction and the issuing of the CPN will resonate with anyone who was thinking about participating in any ASB or criminal behaviour.